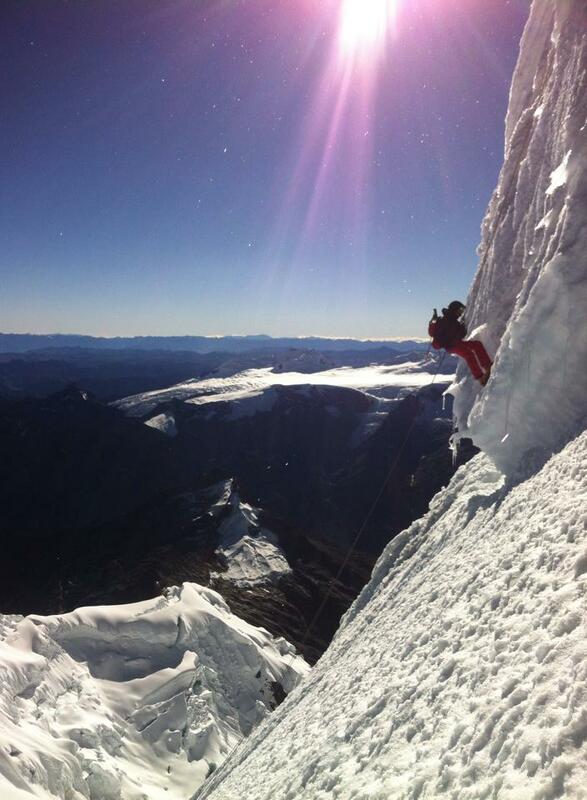 This is an account of climbing the North-west face of tocllaraju in July 2017. 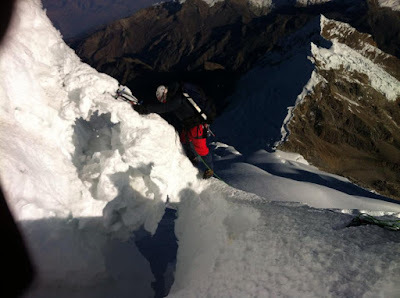 The lovely thing about mountaineering in the Cordillera blanca is that all these high summits are crammed together and you can do things very quick. Tocllaraju is known to be a 4 day climb for acclimatized mountainneers, we decided to do in 3 by linking the first two days together. Some local guides told us it was impossible, which made me want to try this fast ascent even more. Most leave huaraz to go to basecamp on the first day which is an hour and a half drive plus a 4 hour walk to basecamp. The second day is another 4 hour scramble to moraine camp. So Julian, my colombian partner, and I left Huaraz at 6am to reach the trail head at 7:30. 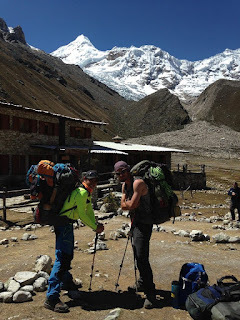 By 8am we had hired a mule and its driver to carry our big packs to basecamp. We reached basecamp just around 11:30, relaxing for an hour From there we carried our big backpacks, 30 kilos, to moraine camp at around 5000 meters. We arrived at around 4:30 pm just in time for supper. Passing all the comemorative plates and crosses on the way up to moraine camp let's you remember that here, mountains are king. To me this was possibly the most intimidating part of it all. 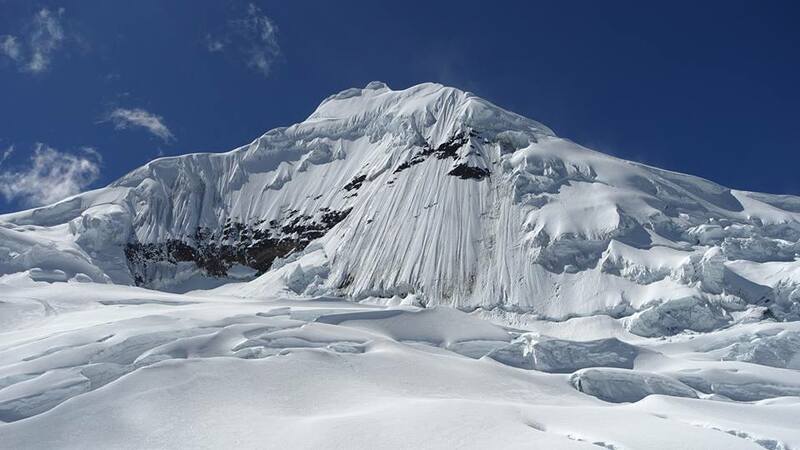 A lot of people have died on tocllaraju and it's not an easy walk like some might think. Reflecting on this we woke up at 2 am the following day to attempt the summit. It was a super windy night, so windy I took the poles out of my tent and had to lay rocks on the top of it all so it wouldnt fly away. We put our boot, crampons and tied in to our ropes directly from camp. As we walked up through the glacier we could feel the wind pick up, it was so strong at times that we had to throw ourselves to the ground and dig our axes into the snow, then we'd wait a few minutes for it to calm! When the wind would calm down for a few seconds we'd hurry as far up the glaciar as possible to gain the time we'd just lost staying still. It was exhausting. It used up all our energy. Most teams turned around because of this. The only team that followed behind was a team of two mexicain Mountain guides. As we progressed up the glaciar we started to get severely burnt and tired from fighting the freezing wind. I got so cold I couldnt feel my toes or fingers. My body started shivering a lot and at one point we barely moved for 20 minutes. The wind got really crazy on us. I feared I might be starting to be hypothermic if we didnt get a move on! I told my partner I was tired and frozen and had no energy to keep going. At this point the mexicans caught up. When they saw my face, they tried to cheer me up by saying the sun would be up in less than half an hour and that the summit was close. One of them even gave me one of his coffee flavoured energy gels screaming through the wind; TAKE IT, THIS IS ENERGY! VAMOS!!! They where really trying to get my adrenalin pumping again. So I took the gel and tried to follow behind them as we switched leads. The time it took before the sun came out was excruciatingly long. But it's first rays were enough to give me some warmth and motivation back. I felt better, like I was actually going to make it! There is a section where you climb up and right of seracs. You need to go quick in this part, apperantly it killed two argentinians the previous year. It scared the shits out of me. As we raced up, Julian, started to throw up from altitude. I screamed to him to keep going a little farther. He pushed on in a warrior atitude and we made it passed the serac. Once you pass this point there are three technical passes. All of them more or less similar. 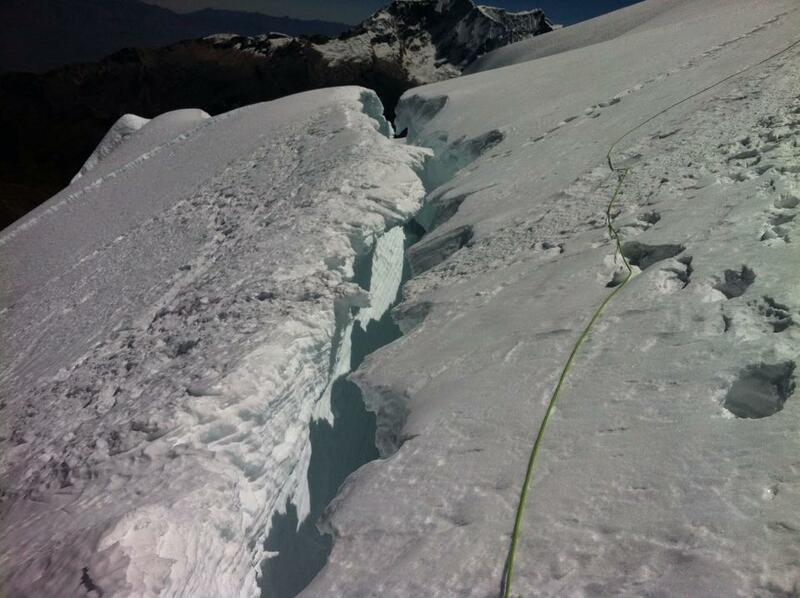 The start with a snow bridge travesing a crevasse to a 45 degree wall. The last pitch is the hardest. I led the steep pitches since Julian had only brought one ice axe. We reached the summit around 9:30 am. The mexicans pulled out their flags and Julian pulled out his colombian flag as well. I almost felt ashamed to not have a canadian flag for the picture! 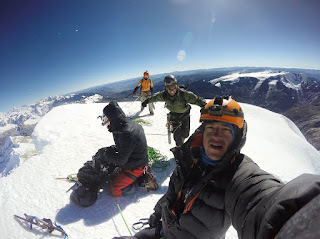 I was still happy, this was our first 6000 meter summit. I couldnt beleive it! We battled hard but it was all worth it. The view from the top was mindblowing. We took a few pictures but we knew the glaciar was warming up and we needed to get the hell out of there! So we prepared our descent. 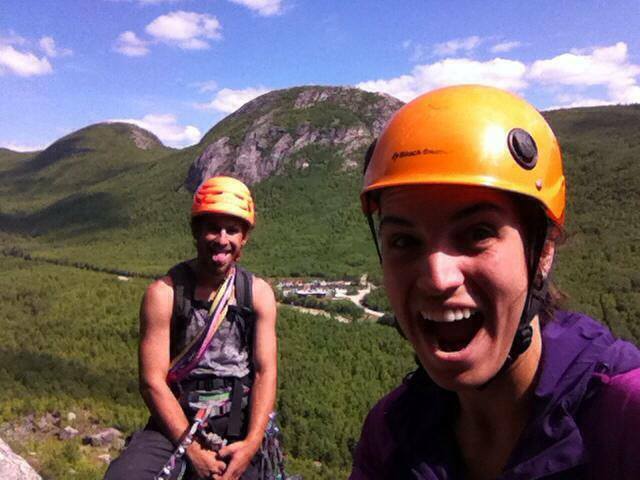 We joined our ropes together for one big 70m rappel off the summit. We teamed up again for the other two rappels. Before running down pass the warming serac! We were anxious about getting off that glaciar! We made it down for 2pm. I had an hour rest at high camp and then, I packed up my things in order to walk down to basecamp. As I packed my gear I gave my fairwells to Julian. This makes for a big day but it feels good to end the summit day in base camp. Julian wanted to stay in the Ishinca valley to try the other peaks in that area. The next day I walked vback out of the valley and hitched a ride back to the city! What an adventure. I'm Very happy to have accomplished the 3 day mission! Such strong winds, such amazing friendships, such imense beauty! We sumited toqllaraju on July 22nd. I hope to climb with you again soon! Interview with Denis Urubko following the rescue on Nanga Parbat. 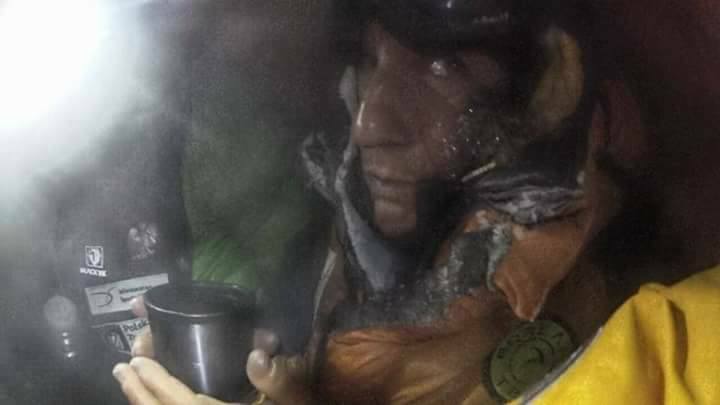 Original interview of Denis Urubko in Spanish by Darío Rodríguez / DESNIVEL - Sunday, January 28, 2018 - Updated at 9:10 p.m.
Denis Urubko "It has been a wonderful experience to help a person as extraordinary as Elisabeth Revol survive"
People have to help each other, especially climbers, and more so when it comes to someone as extraordinary as Elisabeth Revol, whom I respect a lot. 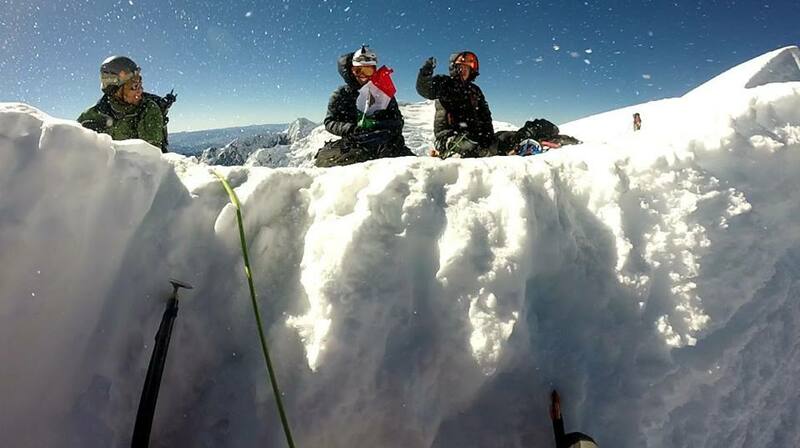 It has been a unique experience to help her survive in such a delicate situation in winter in the Nanga Parbat. Of course. I have not drunk in 20 hours, my eyes are a bit burned by the sun, but we are also very satisfied. Now we meet Adam and I at the hotel in Skardu, resting and feeling that we have done what had to be done. Of course we are not totally satisfied because we could not help Tomek. But it has been great to be able to rescue Elisabeth Revol. "No helicopter had landed before in this place, so close to camp 1"
Why did you make the decision to do the rescue on the Kinshofer route? We went with the ice axes and had to overcome some ice slopes, but we were also very lucky, because -as I told you- we found many fixed ropes in the route, and this allowed us to ascend quickly. The fixed ropes in the Kinhsoffer wall were in good condition and we were able to overcome it without any additional risk. How much did you ascend until you reach Elisabeth? A thousand meters? No, more ... around 1,200 meters ... What is clear is that we could not sit idly by. We had the possibility of doing it and Adam and I have been lucky enough to be able to help another person, showing that we are athletes, that we are human beings. The helicopter left us one hundred meters below field 1, at about 4,800 meters. No helicopter had landed earlier in this place, so close to camp 1. When we approached, I was guiding the pilot and I said "If there is a possibility, leave us here" and he said "Let's try it" and he deposited us in that place. The moment the helicopter left us there was also an epic, heroic moment of this rescue. Immediately, we begin the ascent. "We were very lucky: we were able to use the helicopter, we were acclimatized, we had the necessary material ..."
How many hours did you delay since the helicopter left you until you got to where Elisabeth was? About 8 hours .. It was night. We wanted to go light but we had no choice but to carry weight because we had to transport rescue material: store, medicines .... We made a great effort that we are absolutely satisfied with. 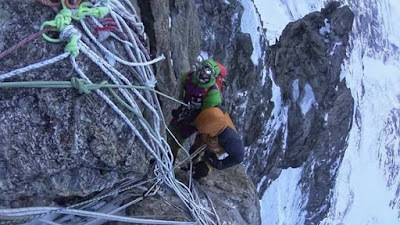 I think that any climber, in case of a similar situation, would do the same thing that Adam and I have done. We were very lucky: we were able to use the helicopter, we were acclimatized, there was a budget to carry out the rescue, we had the necessary equipment ... We just had to give our best. We had to do it. How high did you find Elisabeth? At six thousand meters, about fifty above camp 2. We had just passed camp 2, which is about 5,950 meters. When we arrived everything was totally dark, I could not see anything. On the radio someone told us that he had seemed to see a light descending. I started to scream-it was windy, it was a real miracle-and we heard a voice in the darkness. It was a great joy because we knew that we were close to her and that we were going to be able to help her. She is a very strong woman who came down by herself, in a really extreme situation. He managed to descend slowly until we met. At that moment we felt that our mission had been a success. Everything has been a miracle. The helicopter pilots landed in a truly incredible area a little below field 1 of the Nanga Parbat. This helped us a lot because it left us relatively high. Immediately we begin to ascend. And Elisabeth kept fighting until the end, descending with a very strong mentality. She is a totally incredible woman. "We rested four hours in a very small tent in camp 2 and at 6 in the morning we started the descent"
How was Elisabeth when you found her? It was totally destroyed, its fingers were very white, it descended to -perhaps- 20 meters an hour. She was freezing, very cold, she was very tired but, in any case, she is a very strong woman who was doing something extraordinary. A woman who can do great activities in the future because she is an authentic climber. Yes, she is a very strong and motivated woman. How was the descent with Elisabeth? Very difficult? It was not difficult. We did what is normally done in a rescue operation. You have to be aware of a person who raps very tired at high altitude and this takes a long time. We rested four hours in a very small tent in field 2 and at 6 in the morning we started the descent, rappelling, always step by step; It took a lot of time but, in any case, we did it the way we have to solve this kind of situations. How did Elisabeth spend the three nights until you rescued her? It is better that she tell you, that she is the one who tells you her adventure. The few hours we rested we did in a small bivouac tent for two people, but there were three of us. We gave her some water, medicine, and she was able to get some sleep sometimes leaning on me, sometimes on Adam. We were happy to be able to help this great woman and mountaineer. Adam and I did not sleep at all. The important thing was that Elisabeth slept a few hours. Was it a tent that you found or did you bring it with you? We went up with a very light bivouac tent. We found a very good platform to install at an altitude of 5,950 meters, in camp 2 and we could rest for a few hours, enough to heat some water and give some medicines to Elisabeth. "We had to make a decision: either help Elisabeth survive or continue up with a very slight hope of being able to find Tomek"
How are the freezes that Elisabeth has? Very serious? They are not terribly serious, they have frostbite, I have seen much worse ... I think it is even possible, I hope, that she can overcome them without major operations and that within a year she might be climbing normally and we can see extraordinary climbs carried out by this woman . Where do you have the most severe freezes? On the hands or on the feet? Regarding the feet I'm not sure, but the fingers of my hands I saw them at night. They were very white and when they started to warm up they went black, but they did not look extremely black either; It was like a shadow on the top of the fingers. I think they are not excessively serious freezes. At that moment we had to make a decision: either help Elisabeth survive or continue up with a very slight hope of being able to find Tomek. We also had a very bad weather forecast for the following days. It was evident that we had to stay with Elisabeth, who was very weak, and that is why we decided to focus on helping her. Both Adam and I are not in a position now to face the rescue of Tomek, in case anyone wants to try ... But it has been three or four days since Tomek had the problems due to altitude sickness and Elisabeth told us that he was in very bad conditions. It is very difficult to think that nobody can help you now. Do you know if they reached the summit? Yes, Elisabeth confirmed it to us. Do you think Elisabeth could have survived without your help? Miracles happen. I think she is very strong, but in the morning the force of the wind grew a lot until it became a real hurricane, and I have many doubts that the helicopters could have flown to help her at that altitude. And, also, her fingers were so bad that it was very difficult for her to rappel on the Kinshoffer wall. Our help was key. "We want to return as soon as possible to the base camp of K2 to continue with our objective"
We have to rest one night in Skardu and then, of course, we have to return to our expedition to K2 because our goal this winter is K2. 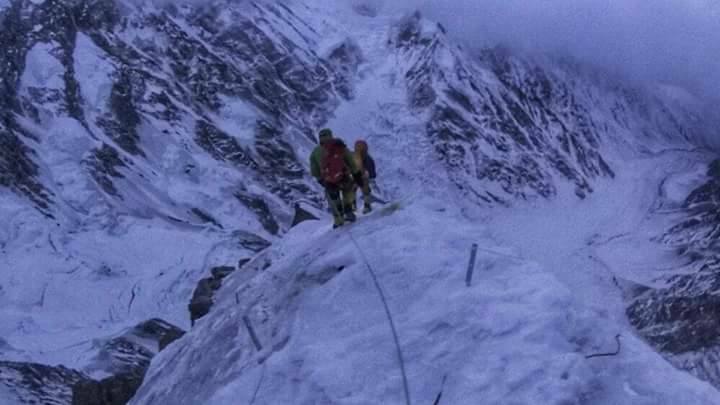 It has been a pride to be able to rescue Elisabeth in Nanga Parbat but our goal is K2. And how are you going to return to base camp? Trekking? No ... the helicopter will take us back to base camp. But now it is very bad weather there and we will have to stay two or three days in Skardu because it is impossible for the helicopters to fly to the base camp. Yes, of course, but I can not say ... [laughs]. Our leader, Wielicki, wants to see us again in the base camp focused on the ascension of K2. By the way, how are you planning to climb K2? Now I am on the winter expedition to K2. If later I set a goal in winter, it will be the Broad Peak and Gasherbrum 1, to acheive them in the real winter. You know my opinion: winter is December, January and February. If later I have any chance to go to Broad Peak and Gasherbrum 1 in winter I would like to go. Hers's footage from the Goldfinger boulder comp that took place at Vertical climbing gym in Montreal this past month. It was a pleasure to be part of the organisation for this succesful event. Adam Ondra Sends "Project Hard," possibly the first 5.15d. 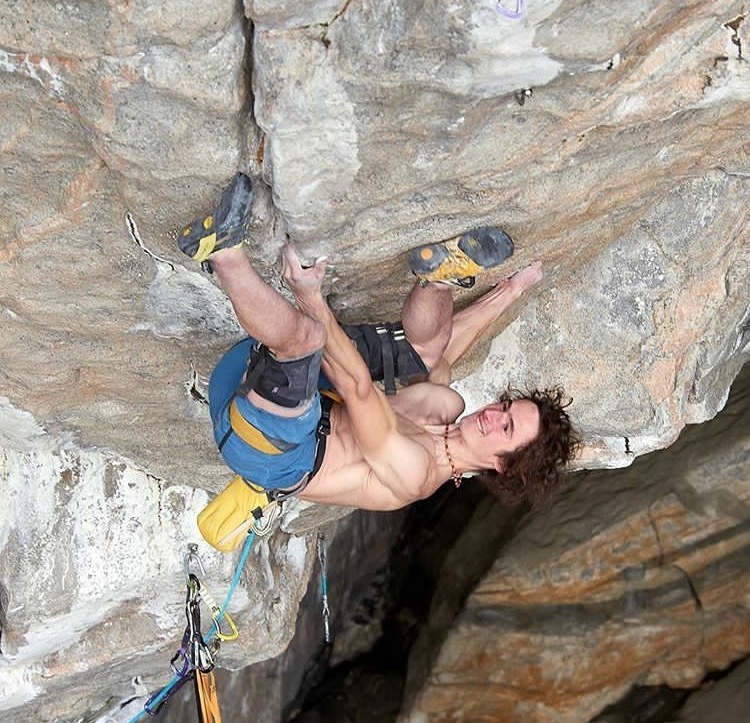 Yesterday, on September 3rd Adam Ondra sent what would be the first 5.15d. His route called ''Project Hard'' is found in the massive granite grotto of the Hanshelleren Cave, Flatanger, Norway. The futuristic line is basically a 45 meter overhang linking a few of his previous routes in the cave all together. It follows 20 meters of 5.13+ to a kneebar rest; then, a few meters of jug hauling lead to a 10-move V15... hahaha. Obviously, this is the crux involving upside-down toe-jamming and impossible fingerlocks on a hanging prow. Two more cruxes follow: one V13 and the other V9. Here is a little teaser video of him working the line back in May this year. In this video, he links an adjacent 5.15b into the second crux of the project. Seriously though, this is just insane!!! Cant wait for the full clip to come out! Climbing in the Grands Jardins! Climbing in Charlevoix region is heaps of fun. We drove up for a late august week-end. 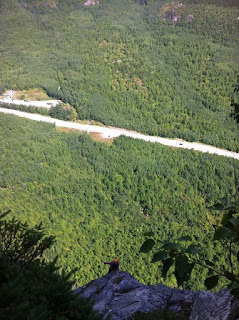 We climbed on of the most famous cliffs in the area called Gros-Bras. Gros bras is a 250 meter rock-wall which is known for adventure type climbing. You have to expect loose rocks, wet cracks and lichen everywhere. For this reason, we chose one of the more traveled lines for our first time in the area. We climbed ''Hals Und Bienbrunch'' which means good luck in german. As I was climbing up the first pitch Roxanne screamed to alert me there was a black bear no more than 20 feet away from her. So I built a quick belay station in the middle of the pitch so we could get her off the ground as quick as possible. From there every thing went pretty smoothly until the top. It was a great week end. Here are a few snaps from the climb! I went to the Quebec North Shore for the first time in July 2015. 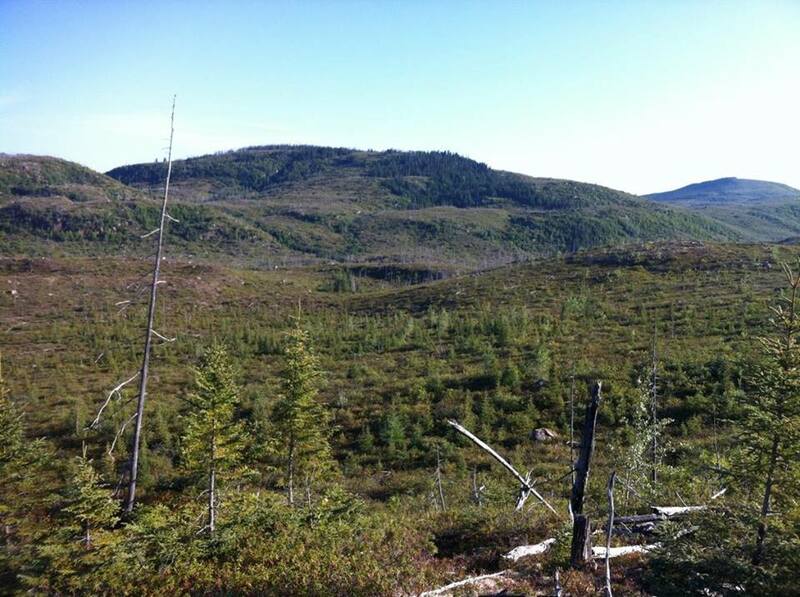 I was up there for work; we had a team of scientists and students collecting data concerning an invasive species, the spruce budworm. The spruce budworm is a bug that eats the needles and destroys most pine and spruce trees. The job was great as we spent our days outside and we moved around a lot to sample different parts of the forest. 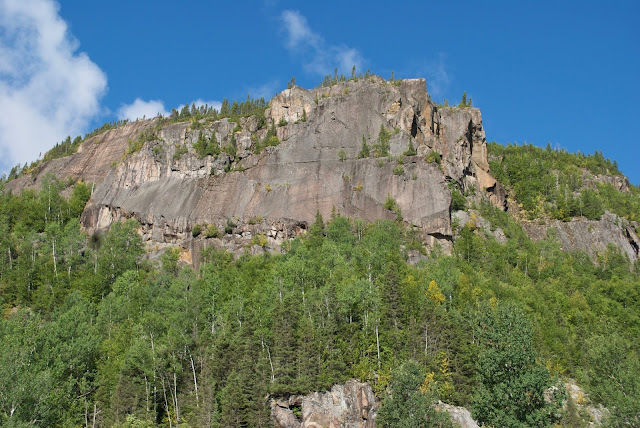 While driving along the ‘’Toulnustouc’’, a well-traveled logging road, I noticed the massive cliffs that were for the most part still unclimbed. These walls, to me, made most climbing areas established in Quebec look like nothing interesting. I had brought my gear and I got to climb a bit. But in the end I only climbed what was already established. Mostly we worked hard and spent our week-ends fishing. At the end of the summer, I left the untouched rock as it was and set off from the north shore with this feeling of unfinished business. The guys from the team called me again this year and asked if I was up for more work. I gladly accepted. The guys there are amazing people and I knew I was in it for some fun. They also told me that they had started climbing and wanted me to bring my trad rack. Hugues, the field manager, was especially keen on pushing his limits and trying something he had never done before. As the days passed we looked at every cliff trying to find a big project. We were looking to establish our first multi-pitch trad route. 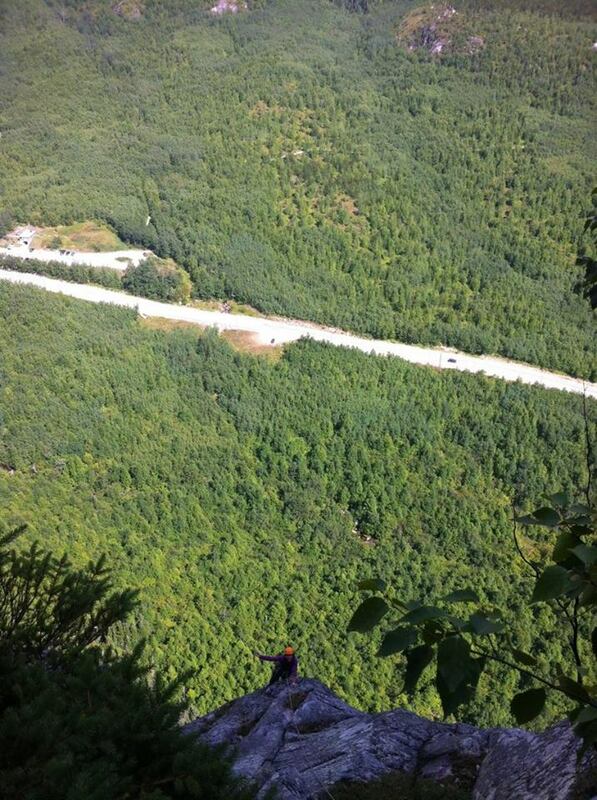 The cliff we chose sits next to the 37th km of the “Toulnoustouc” road. It is a slightly slabby face which stands 95 meters high. We took a few pictures from the road to help us pick out the perfect line. From there on we started putting our skills to the test. We spent days placing and taking out gear on single pitch routes, we went over our anchor building skills as well as bailing strategies. We expected the line to be fairly easy but we really had no idea if it would go smooth the whole way up. For Hugues, it was going to be a first of many things. We had to go over a lot of big wall climbing knowledge to make sure everything we did was 100% safe. It didn’t matter how fast we were as long as we were in control. I felt a little nervous at the start of the summer, but as the days went on I became very confident we could pull it off. On the morning of the 24Th we both had a big breakfast including eggs, bacon, potatoes and coffee. I had chosen a special set of nuts from my dad’s old rack that I was ready to abandon up there in case of an emergency rap. I threw them in the bottom of my backpack. We drove up the road with all the excitement in the world. It might not have been the most amazing line out there but it sure felt like it. We parked the car by the side of the road, racked up and started scrambling up the boulders towards the base of the wall. As I started up the crack we had chosen I felt confident and happy because the line felt just as easy and smooth as I expected it to be. The only annoyance was the lichen that covered both sides of the fissure. After about 30 meters of easy climbing we set up an anchor on a tiny ledge with a few trees growing on the bit of flat rock. From there we decided to modify the original idea and follow an attractive crack going leftwards. The challenge was the section between our anchor and the start of the crack. I placed only one little piece of gear and pushed through a good section of face climbing still comfortably under our limit. We judged it fine to run it out before placing my next piece. The crack itself was pretty similar to the one in the first pitch; covered in lichen, shallow and full of dirt, but at least the view was getting better. As I started to set up my anchor from the top of the 2nd pitch, Hugues told me his aunt named Muriel had passed away the previous morning. There was something special about what we were doing. We felt privileged to be up there with such a beautiful setting. We were alone surrounded by kilometers of forest. I am sure she would have been super happy to hear of our climb that day. So as Hugues followed his way up I asked him; what do you think about naming the route after her. He smiled and said that was a great idea! As we got up the top of the third pitch filled with pride we screamed our victory towards the valley in honour of Muriel! It was the perfect project for the time and skills we had. I am looking forward to next year’s goals already. We graded the climb 5.7 and hope she will get a bit of traffic in the years to come. 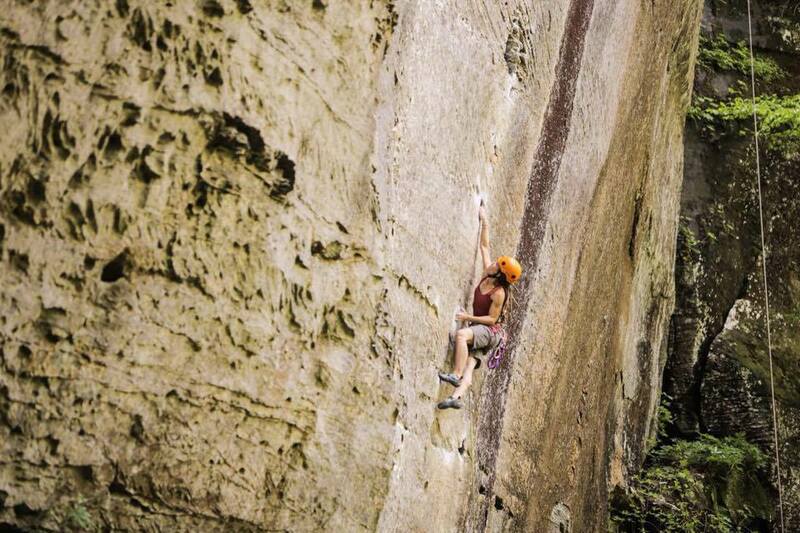 The Red River Gorge is possibly the number one climbing destination on the entire east-coast of North-America. 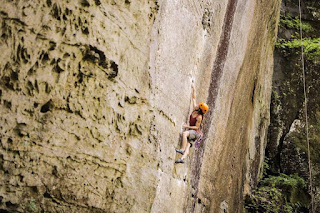 I had heard of how amazing the sport climbing was in the gorge. It's crazy jug-hauls and stunning scenery! I soon realized that the thing about climbers in Kentucky, is that they've all been there before and they'll all be back again and again. I was shocked to realize that I was one of the only climbers visiting the Red for the first time. I was a rare bread . That, for me, was a clear message that the Red River Gorge has more than anyone could ever ask for. As my partner, Roxanne, and I spent our first days in the gorge we discovered something beautiful. We discovered the orange sandstone faces covered with natural Iron-oxide bands. The Iron formed the strangest mandala-type of rock art cemented deeply into the Kentucky cliffs. Our jaws dropped. It was like climbing in a dream, we pulled our bodies up into massive hueco's that where perfectly placed at mid height, between the ground and the anchors. We swung on overhanging roofs from a bucket-jug to another. As we arrived in the Red River Gorge, I was sure I'd be crushing all 5.11's and 5.12's in a matter of days. I was humbled to learn that my endurance level wasn't ready at all for this level of steepness. After a two month break from climbing, I got flash pumped on the easiest looking 5.10's. It took me a while to build up the energy to start climbing what I was expecting to climb! Its hard not to get frustrated at first. This is the reason guy's like Arno Ilgner teach us to climb without ego and without any expectations including grades! I guess, this is also one of the reasons why climbers keep returning. The other reason why climbers are drawn back to the Gorge year after year, is the rapidity of the expanding crags. The route setters are unstoppable and the crag development is far from slowing down even after all these years. To this day, there are three hefty-sized guidebooks that cover climbing in the Red River Gorge. One guide is for the North, one is for for the south and another is for a brand-new sector called Millers fork. The Irony about Miller Fork, is that only 6 months after publishing the book. Most people are saying that the topos are already seriously outdated. There is just way to much climbing to be done in one trip. 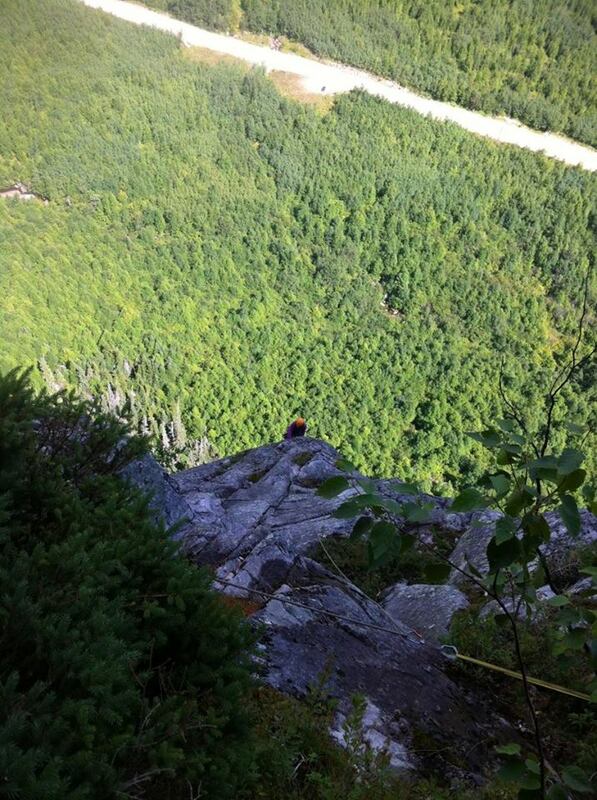 Obviously, the Red is known to be a sport climbing destination above all. 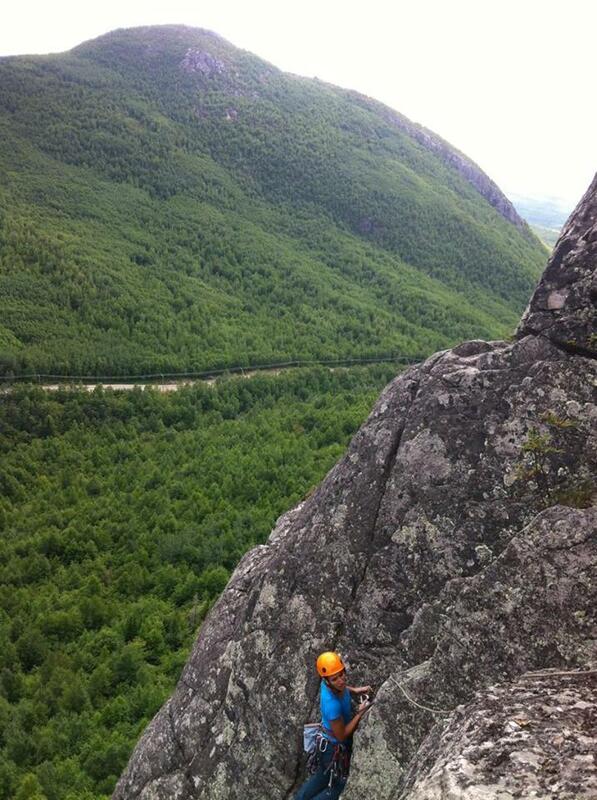 But that should not take anything away from some of the incredible trad routes to be found in the area. 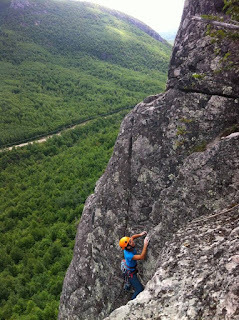 There are heaps of amazing traditional routes you can find amongst the kingdom of bolts. I recommend the northern book for all the tradies, but you will find some 5 star cracks in the southern gorge including Miller Fork. Now for a place to stay; the cheapest, most obvious place to stay would be Miguel's Pizza/Campground. They make delicious pizza and offer a 2$ a night stay! It's the perfect dirtbagger option. You can also stay at Lago linda's, It's a quieter more relaxed Hideaway. It's a great place for dogs to run around and great if you also want a Shower... Showers at Miguels also exist, it's just more of an adventure! Finally, there is also the Land of arches which is similar to Lago lindas. It's in a different location, depending on the areas you would want to go to! All in all, for me Kentucky was a lot of fun. The taste of the good bourbon we had down there is one of my fondest memories. The whiskey just makes it an ideal place for climbers! Again on the plus side, the good'ol Kentucky accent wont let any traveler down. It just makes me so happy when I get to chat with the locals! Red River Gorge! I'll be back! Explore The Needles from your computer screen by clicking and dragging around this 360° video. Are you ready for your first free solo? I am not so much of a boulderer as I am of a route climber. 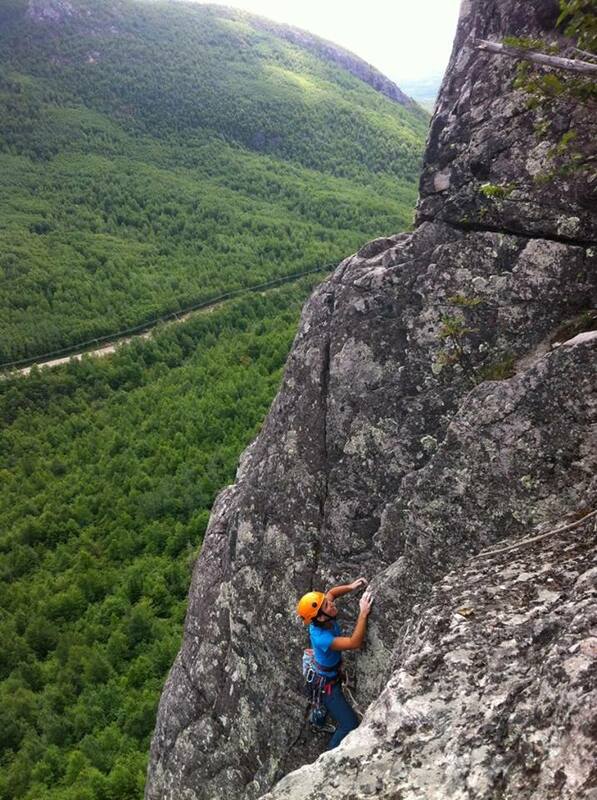 I really enjoy climbing long trad multi-pitch alpine style. I prefer the adventure over the 12 foot boulder problem. But, sometimes it helps to boulder a bit in order to get that extra power. Bouldering skills are essential to the ones who seek progression. 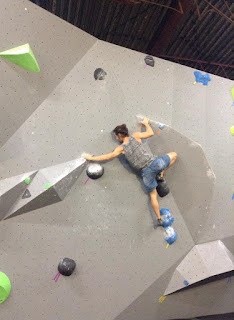 So this is the story of how I got in to bouldering. That's also the story of how I got my bunions... Thanks a lot for the bumps on my toes you: Boulder Gym! The story is simple. I trained in a boulder gym about 3 times a week. If you boulder indoors,you might have realized what I didn't. Most climbers you will notice just walk around the whole time in their climbing shoes. I mean most of them wont take them off period. I did the same, because I am just as lazy as every one else! I didn't have a reason to take them off. Id rather tolerate the pain. After a few weeks of consistently doing that, I started developing a tailor's bunion on my left foot. The tailors bunion is the bump that appears on your baby toe. Most people get it on their big toes. I need to mention that I was also wearing an aggressive tight pair of shoes which is definitely not the same as your casual slipper shoes. Thus, I still think no matter which type of shoes you might be wearing, it is still really healthy to pull'em off between every problem so you let your feet breath. First, I recommend using bigger shoes or even cutting holes out of the edges of the climbing shoes. Make sure there isn't any pressure on the bump or the skin. Second, try ordering a bunion protector gel online. You can get them for super cheap. They help mostly when your not climbing. I wouldn't wear them while climbing, but they help overall. Third, what a great timing to start training on the campus wall while your feet heal slowly. But make sure you stretch you're arms properly to stay away from tendinitis. Nothing is worse than a chain of climbing injuries one after the other. For better results, try stretches like pulling your toe outwards whenever you can and keeping it for 30 seconds 4-5 times a day if possible. It sure helped me get stronger toes. I also recommend to apply an ice-pack on the bunion especially at night. It wont alleviate the pain but it will help reduce swelling. Hopefully you will be back to crushing in no time. I have never been a big Star Trek fan. But I might have become one after seeing this clip. I heard Alex Honnold talking about El cap. He mentioned that only person had the skills of free soloing El capitan and that would be Captain Kirk. His comment made me laugh but than again, I'll lift my hat to Mr.kirk since he had the balls to actually try this risky ascent without a rope. So there you go: Captain kirk, the only guy to ever free solo El capitan. Although he didn't make it to the top so... it's still up for grabs Mr. Honnold. A few months ago we had a post where we shared a Paige Claasen podcast. The podcast was one of NausicaaCast's which you can listen to by clicking the link. Here is another 50 minute podcast but this time in a completely different style. Alex Honnold meets with MtnMeister's host Ben Schenck. 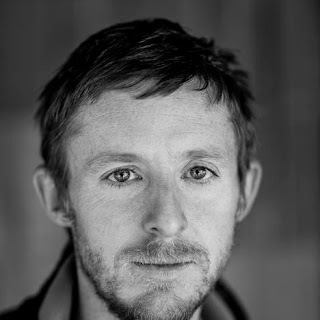 Alex is the most known figure in rock-climbing today. 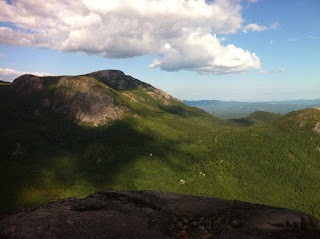 Tommy challenged Mountain Project forum users to ask him "thought-provoking" questions, then he chose several to answer. His replies are pure gold. 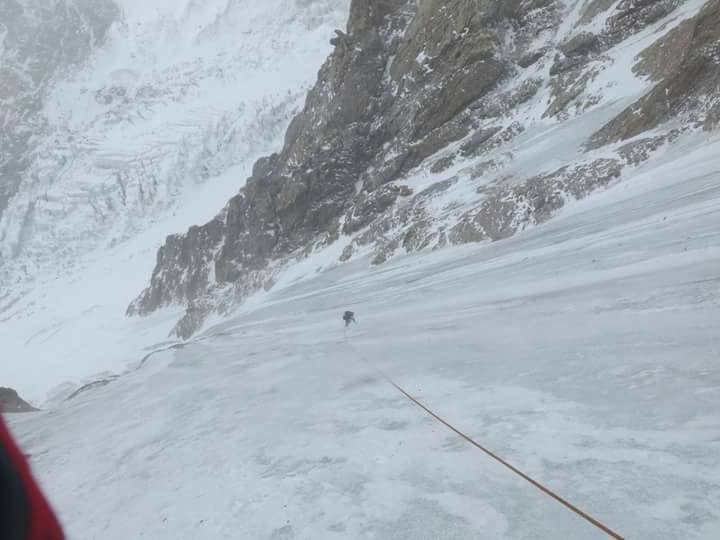 Your climbing accomplishments to this point are truly inspiring and have an unusually broad spectrum for any one individual: gymnastic difficulty/strength (eg Flex Luthor), Risk management/alpine suffering (eg Fitz traverse), and long term commitment/endurance (eg Dawn Wall). Do you consider yourself an outlier in terms of ability, motivation, and/or attitude? What is your greatest attribute that has allowed you to reach this level? I like this question because it speaks to the heart of mastery, anyone looking to better themselves ponders these very questions. I believe that the successes I have had do not come primarily from natural ability. Of course I am genetically built to be a pretty good climber (scrawny). But there are thousands of climbers out there with far more natural talent than I will ever have. For me it is more motivation and attitude. I am a die-hard optimist; this means I learn to love what I know. I spend my life in the most beautiful places in the world surrounded by psyched people (my dad, Steve Hong, Chris Sharma) to name a few. That is the beauty of a life of a full time climber, a constant flow of inspiration. I have a deep curiosity to explore limits. But I think my greatest attribute comes from what my friend Jim Collins Calles the 20 mile march mentality. Every day I wake up with the same question, What can I do today to bring me a little closer to my gaol. The goal really is just a focal point and changes from time to time. I am addicted to the chase. My mental well being and general view of the world seem to be directly correspond with how vigorously I am perusing that next goal. All the climbs you mentioned were possible for me because of the cumulative time spent bettering myself as a climber. Throughout the history of climbing there have been numerous quantum leap advancements: think sticky rubber, cams, form fitting shoes, legitimate belay techniques, dynamic ropes, fixed climbing protection, focus on free climbing, bouldering, sport climbing, climbing as an athletic sport as opposed to means to summit or to have an adventure, climbing as a career. What will it mean for your accomplishments if a substantial "advancement " allows the rest of us punters to run up the Dawn Wall before lunch? Advances in technology constantly re-define the game allowing constant progression. There is nothing more motivating than that feeling of progression. But, it in no way takes away from the experience of the past. Do you look at Royal Robbins or Warren Harding and think to yourself, “those guys were so light duty”. I doubt it, if anything, the advances in technology serve only to create nostalgia and admiration for the people that managed to climb without that technology. Technology is the reason rock faces like El Cap has been able to constantly reinvent itself for each generation. First as a question of “is it possible to merely climb the thing using any means. To how fast, or how blank of a section of the wall, or can these routes go free. Who knows what the future will look like, but I am excited to see it go down. Climbing has been accused at times of being a pointless and selfish endeavor, a means with no end. Occasional defenses of climbing involve abstracts such a facilitating self growth, learning about one self, inspiring the masses etc. What has climbing given/taught to you in life besides a career path and a decent living? I once read a quote from Andrew Bisheret “Climbing is about deriving meaning from the meaningless”. Its true, on a practical level climbing is quite meaningless. But aren’t most endeavors. Like say, typing on a internet forum, or any sporting endeavor, or making money, or having kids. What is truly selfless. I am sure even Mother Teresa derived personal satisfaction from helping others. Having kids is a great example of what many call a selfless. I absolutely disagree. From a environmental standpoint, having kids must be about the worst thing you do. The media event surrounding climbing the Dawn Wall created the opportunity for me to help a bunch of charitable organizations by presenting at fundraisers, (about 25 last year) for now this seems to be the mot effective way for me to give back. Part of the reason I do this is to give back. But I also do it because it makes me feel good. So maybe I am dong it because I am selfish? As climbers, we may be more selfish than most, But I like to think that climbing fosters good things like a appreciation for our natural world (and a subsequent want to protect), comradery, love of life, love of people. To me, these are the beautiful things in life that we need more of. 1) Years ago, when you cut off your finger, what were the psychological repurcussions? How long was it before you knew that it wouldn't affect your climbing at the harder levels? Cutting off my finger had the psychological repercussion of making me realize how much I valued climbing (because I wondered if I would still be able live the life through climbing that I lived) It made me buckle down, train harder. I had to want it more so I wouldn’t loose it. Surprisingly, This became the biggest moment of growth in my climbing. It pushed me in the direction of El Cap and more adventurous forms of climbing (because I knew my fingers would never be as strong as they were for steep sport climbing and bouldering). It turns out I was much better at adventure climbing anyway. Its called Post traumatic growth, its actually pretty common. 2) Has your approach to risk changed since you became a father? When you go after projects like the Patagonia traverse, does thinking about Fitz play a role on the your level of acceptable risk, either consciously or subconsciously? The big change that being a father had made in regards to risk is that I am much more thoughtful. I heavily consider the risks that I choose to take. It hasn’t really changed my day-to-day decisions though because I always chose to climb things I was relatively sure I would live through. I would say that I am more motivated by climbs that challenge Physical and psychological limits and less motivated by climbs that toy with the risk line. I won’t climb under hanging snow fields or in bad avalanche terrain. I rope up on glaciers; I look for big clean rock faces with little chance for rock fall. I admire hard work over boldness. But I still love a great adventure. Some of this might come from the fact that I am naturally relatively bold but weak. We tend to value the finite. The last thing I want to do as a father is to live in fear. I want to foster in my kids the ability to asses risk so that they will be prepared for a world where a certain amount of risk is inevitable. Climbing provides a great classroom for that. 3) Looking back on the time you were captured by rebel forces while on the wall in the middle east, do you find you have any PTSD left over from having to attempt to kill someone else in order to escape safely? I will probably never fully understand the psychological effects of the events in Kyrgyzstan. What is PTSD anyway? I know that ever since that trip I have felt the need to live everyday to its fullest. I value family and friendship more now. I had a few nightmares in the months after the trip. My x-wifes Therapist blamed our divorce on a codependency issues that were a ripple effect from Kyrgyzstan. For the most part Kyrgyzstan was a coming of age moment that made the rest of life seem pretty mellow in comparison. It redefined suffering and stress and fear. I doubt I would be where I am today without that experience. With a career focused around a esoteric pasttime, do you ever feel that you could be doing something more important? This is not to belittle you or your achievements, but do you ever consider changing to a career that adds societal value? For better or worse climbing is what I know and what I love. I don’t consider changing careers because I feel incredibly lucky to have the career that I have. With climbing get to be a explorer of sorts. I think anyone that has this opportunity in life should seize it. 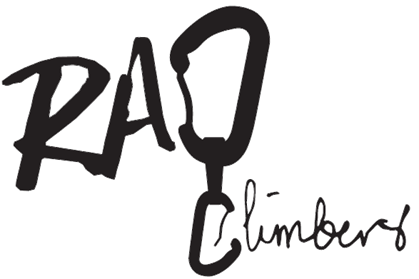 What does it look like to you to have a meaningful impact as a climber? What is meaningful impact anyway? I mean, Climbers aren’t saving the world. We are just doing the best we can with what we know. And it makes for a pretty great life.